Over the long weekend I made some hard executive decisions about Buckwheat which resulted in me knitting like a crazed woman possessed. Knitting as if my yarn was on fire and I had to knit as fast as I could to beat the fire before it could eat up my precious yarn. As any knitter would know, such marathon knitting can cause stress and injuries to not only our valuable hands and wrists, but to the rest of our body as well. There's a few stretches that I do for hands, wrists, and arms to help prevent repetitive motion syndrome that I had learned during my days as a barista (and trust me, I've suffered several bouts of tendonitis and tennis elbow from manning the espresso bar). 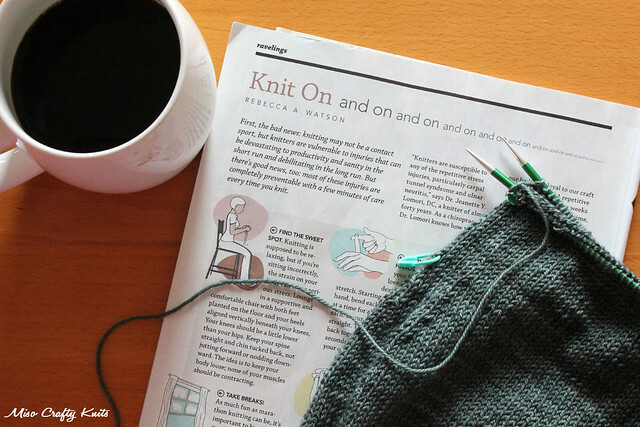 Then this morning while enjoying my morning cups of coffee I took a break from knitting to continue reading the newest issue of Interweave Knits that had arrived in my mail box last week (I usually go straight to the patterns when I first get it and then read the articles and whatnot). And lo and behold, the very last article on the very last page of the magazine was about exercises and the little things you should do every 20 minutes during long knitting stints. Perfect timing Interweave! I'll definitely be keeping the magazine flipped onto this page and close by at all times as a gentle reminder that I MUST stretch way more often than I normally do throughout the day. Especially if I plan on staying a knitter! I hope everyone had a fantastic weekend, whether it was a long weekend or not. Mine was filled with a ton of yummy eats, a lovely visit with a friend from out of town, delicious macarons and coffee, games of road hockey, a ton of marching band music (they all practice right outside my front door), a nice break from the Munchkin (Uncle Travis was visiting and so the kidlet found a willing playmate! ), and of course, a lot of knitting! I'd show you what I've got going but today is Brett's birthday! The Munchkin and I have been spending the day making birthday cards, decorations, and presents. Brett should be arriving home from work any minute now, so I'm gonna jet and make sure the kitchen is clean and that the house looks somewhat decent. Stretch Kat!! You must stretch!! I used to do that too until I discovered how much damage you can cause your hands/wrists if you let them get to the point where they start to go numb. :( I'll admit that sometimes I'll forget, but I definitely try to stretch my hands and fingers as much as possible now, even when I'm not knitting!